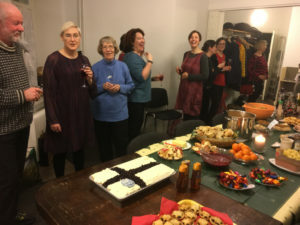 The fourth annual NEaT Christmas party was held on December 5 starting at 5 pm at PAM’s premises in Hakaniemi, Helsinki. The party was free for paid members of NEaT and five euros for non-members. This year, the focus was on the British and Irish, with a programme and food focused on Britain and Ireland. NEaT provided the food and a welcome drink. We celebrated NEaT’s third year in operation and Finland’s 100th year among about 20 colleagues. The “pikkujoulu” party was again a wonderful time to break bread (or, in this case, sausage rolls) and lift a glass, celebrating Suomi 100. We pulled party poppers and decoded Scottish poetry (actually Robert Burns’s “Tam o’ Shanter”) and wrote creative sentences using period vocabulary (see Merriam-Webster’s Time Traveler) and wore paper crowns. Thanks to all who attended and made it so much fun, especially to the Brits who put on the spread!